Classic hardware with a modern touch. 8bitdo's SN30 feels just like the classic Nintendo version, but even better. Editor's note, October 2, 2018: 8bitdo has released new colors of the SN30 that are inspired by the Gameboy Pocket. But while the SN30 reminds me of long nights playing The Legend of Zelda: A Link to the Past, it also introduces a few subtle changes that improve upon the original—a monumental feat. 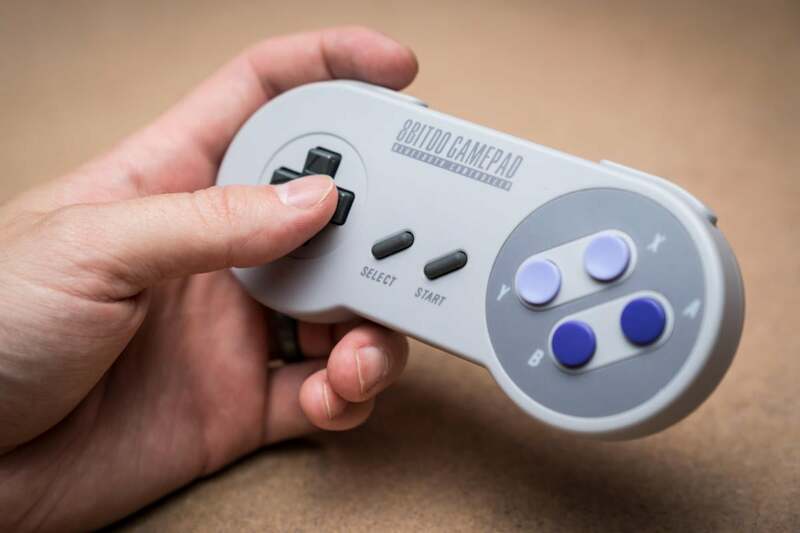 8bitdo’s SNES30 looks and feels just like the original Nintendo controller. The SN30 is fully compatible with Windows 7 and above, macOS 10.7 and later, Android 4.0 and up, Steam, and the Nintendo Switch. Install the ‘Legacy’ firmware in order to use it with Raspberry Pi, Nintendo Wii, and Wii U. 8bitdo's controller supports button mapping and configuration support for X-input and D-input, Mac mode, and Nintendo Switch mode. A 480mAh rechargeable battery rated for 18 hours of playtime is housed inside the SN30, which (officially) takes between 1 to 2 hours to fully charge. These results held true during my extensive time using it. Despite putting endless hours into Super Metroid in the past month I’ve only had to recharge it once. But since you can still play while the controller is charging via USB, it didn’t bother me one bit to be plugged into my PC. The top of the SN30 features a USB port and LED’s for status indicators. The SN30 connects to your PC via Bluetooth 4.0 or an included micro USB cable. A majority of my testing was done on Windows 10 with a USB Bluetooth dongle. It worked like a charm. Despite being surrounded by Bluetooth devices at my desk I never felt any substantial latency or suffered from dropped signals. Turn on the controller by holding down the Start button, along with the X button to map it to the X-input layout. The LEDs light up when the controller is activated. At this point you connect it to your PC by plugging in via USB, or by holding Select to go into Bluetooth pairing mode. 8bitdo’s SN30 feels even better than the original. 8bitdo has held true to the design of the SNES controller—well, apart from the now-yellow patina found on originals. A wave of nostalgia washed over me every time I picked it up. All of the dimensions and features are spot on, right down to the texture of the plastic. I’ve always felt that the SNES controller fits perfectly in my hand no matter what age I was, and it's the same with the SN30. In fact, the added weight of the battery inside 8bitdo's controller gives it a more substantial feel than the original. Comparing the two now makes the classic one feel somewhat flimsy and cheap. The buttons on the SN30 are more clicky than the ones on my original Super Nintendo controller. Part of it could be from the countless hours of wear and tear I’ve put on the original over the decades, but even so I prefer the extra click of 8bitdo's hardware. It takes more pressure to trigger and gives me a satisfying signal that it’s been pressed. 8bitdo also increased the distance from press to bottoming out, which provides feedback and decreases false positives. Although we didn't test it, a Japanese design variant is also available for Super Famicom fans. 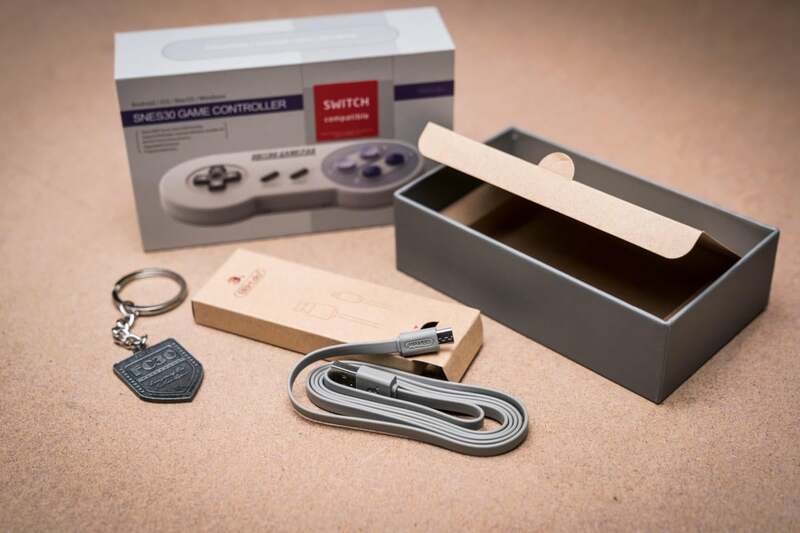 Included in the SN30’s box is a USB cable and a collectable key chain. 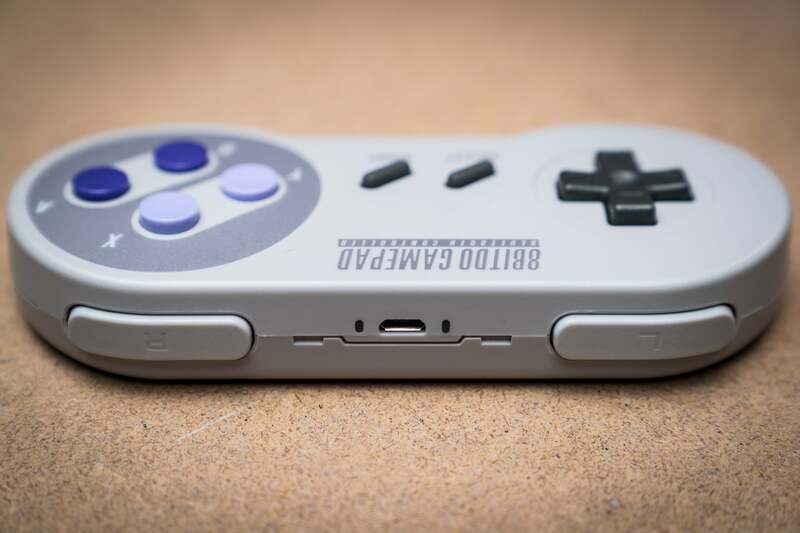 8bitdo's SN30 is an amazing recreation of the SNES controller, crafted with care. I loved my time with it and I've never been happy with the third party controller options out there. If you're into retro gaming, this comes highly recommended. 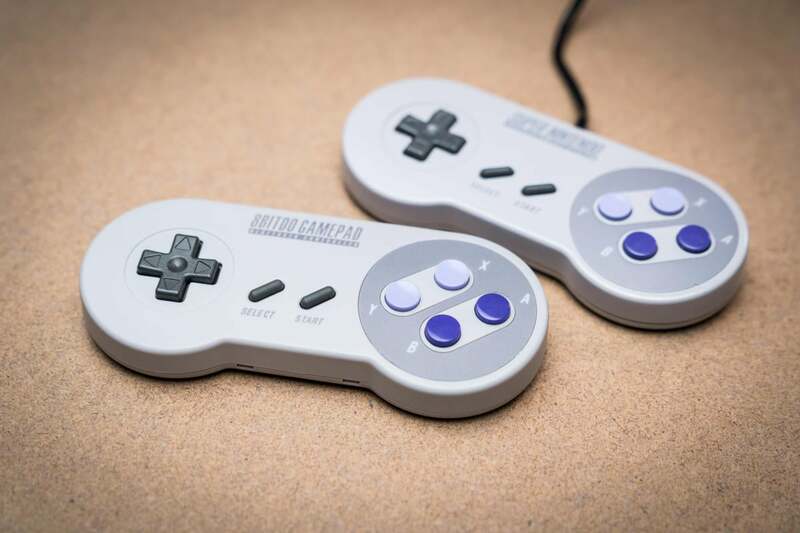 8bitdo's SNES30 stands out from the motley crowd of third-party controller options. It's an amazing recreation of the SNES controller, crafted with care. If you're into retro gaming, this comes highly recommended.